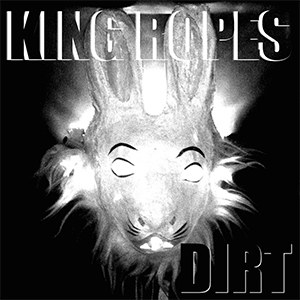 King Ropes, an indie garage band from Bozeman, Montana, effortlessly couples the inventiveness of The Pixies and the alternative country twang of Wilco with remarkable results. Although now a full-fledged quartet, their debut album, Dirt, is essentially the baby of frontman/guitarist Dave Hollier. With a vocal range similar to Neil Young, Hollier is augmented with a sound almost as gritty and raw as Crazy Horse, giving King Ropes a warm authenticity and credibility hard to come by in an already cluttered genre. Whereas some songs like “Long Lost Boy” are pure garage rockers, a greater portion of the record, including the lovely “Dogleg Boy” and “Mandolin and Gasoline,” are melancholy and pensively drone-like. The most telling song on the record, however, is the fantastic “International Shortwave.” More stripped back than the majority of the songs here, it’s the mutated child of an American folk tradition, and, in fact, all of the songs here are, but some are more disguised than others. It’s impossible to tell in what direction the band will go next, but with an album under their belts of cohesive vision and one that seems to have been a long time in the making, Dirt is already a wonderful achievement.